Whatever your moving needs may be, Meathead Movers will help you feel at home in Saratoga. Our professionally trained student-athlete movers and our moving concierge will be with you for the entirety of your move to Saratoga. From sawmills to vineyards, Saratoga is a pastoral suburban community tucked along the edge of California’s hustling and bustling Silicon Valley. If your family is planning on moving to Saratoga, Meathead Movers can help you and your possessions get there in one piece. The story of Saratoga begins in 1848 when a local entrepreneur established a sawmill, and eventually the town grew into a rural village surrounded by orchards and vineyards. Today, Saratoga’s vineyards are still one of the area’s prized attractions. The oldest of these is the amazing Mountain Winery, planted in 1890 by the legendary winemaker Paul Masson. In addition to its famous Chardonnay and Pinot Noir wines, the winery is known for its outstanding summer concert series. The town is also a haven for artists and an epicenter for creativity. Art lovers will love to watch a show at the Saratoga Civic Theater, or listen to a performance by the Saratoga Community band. You can also take painting classes and creative workshops are held at the historic Japanese Hakone Gardens. Check out The Village, Saratoga’s historic shopping district that is full of original boutique, fine restaurants, and unique shops. For more natural beauty, you can visit the beautiful Santa Cruz Mountains, located just a short-distance away. If all this talk about Saratoga’s great attractions leaves you wanting more, Saratoga movers can make these dreams come true. With a professional crew, moving to Saratoga isn’t a challenge. 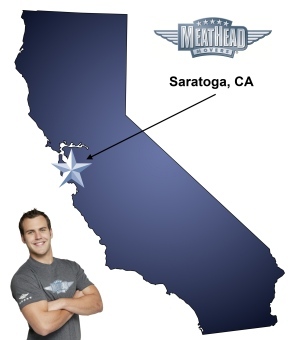 Meathead Movers has been California’s premier moving team since being established in 1997. Our moving company specializes in local, long-distance, and commercial moves to, from, and within Saratoga. All our crew members are highly trained student-athletes who are in top physical condition. Most moving companies take their time because they get paid by the hour. This isn’t the case with Meathead Movers. All crew members jog back to the premises once they place items in the truck, to save you valuable time. On top of superior moving services, we also offer reliable packing services, storage services and a moving concierge service that connects you with local service providers. These are just a few tools that we can provide to ensure that your move is smooth and efficient! We are so confident in our superior services that we offer a 100% satisfaction guarantee, so you can relax knowing that you have chosen the best movers in the industry. Call our office directly to receive a free personalized moving quote or to learn more about our professional Saratoga movers! Moving to Saratoga? Here are some helpful resources.